Our Namibia Flying Safari – 12 Days is an awe-inspiring exploration of this vast country, via air and land. Our itinerary begins in historical Windhoek, then stretches from the endless, rippling sands and towering dunes of Sossusvlei to the dolphin-filled waters at Swakopmund and Walvis Bay, through the stark plains of Damaraland and onto the Etosha Pan. Etosha, meaning ‘Great White Place’, is made of a large mineral pan, where abundant wildlife has adapted to this wild and arid landscape. This is a truly unique African experience, encompassing extremely varied landscapes and cultures, and is not to be missed. For the ultimate in contrasts, combine this with our Great Wing Safari Botswana. Land from $7,595 per person. Your Africa adventure begins as you depart USA on your journey to Namibia and your Namibia Flying Safari. Welcome to Windhoek! With roughly 350,000 inhabitants, Windhoek constitutes the largest city in Namibia and is situated in a lush and scenically appealing valley of the Auas Mountains, Namibia’s second highest mountain range. Due to its central location, the city serves as the perfect vantage point to Namibia’s vast array of tourist destinations. The city is a kaleidoscope of modern and traditional cultures, fashions and architectural styles. The balance of the afternoon and evening is at leisure. Wake up to your first morning under an African sun. After a leisurely breakfast, you are collected and transferred to Eros Airport for the beginning of your wing adventure across Namibia. Your flight takes you over the great Escarpment into the vicinity of Sossusvlei. After landing you are transferred by vehicle to your lodge, Situated at the Entrance Gate to the Namib Naukluft Park. The rest of the day to your disposal. This morning demands an early start. The first rays of sunrise paint the mountains of sand into a variety of apricot, red and orange, contrasted against a crisp blue skyline, enrapturing our senses, and providing an opportunity to capture this awesome landscape on film. You will be astonished by the surreal Dead Vlei. Once an oasis, this ancient clay pan is studded with acacias and fed by a river that suddenly changed course, leaving the earth to dry up along with the trees it previously supported. So dry were the climatic conditions that the trees never decomposed – instead they were entirely leached of moisture so that today, 900 years later, they remain as desiccated, blackened sentinels dotting the pan’s cracked surface. 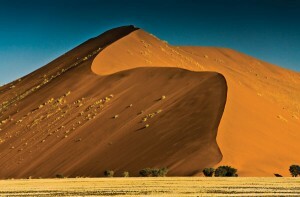 Surrounded by the red-pink dunes of the Namib Desert, they create a surreal spectacle that is a photographer’s dream. The vlei is surrounded by the highest dunes and Sossusvlei, with its rich ochre sand dunes offering one of the most mind-blowing sights you will ever experience. Their oscillating crests rise to an astonishing 320m and, with their air of timelessness, create an unforgettable wilderness in the heart of the world’s oldest desert. Take the opportunity to walk up one of these dunes to admire the desert landscape beneath, part of Namibia’s own Salvador Dali “painting”. After breakfast you are transferred to the airport for your flight to Swakopmund. The entire flight takes you over the dune landscape of the oldest desert on Earth, and along the Atlantic coastline. Having arrived in Swakopmund, the rest of the day is spent at leisure. With palm-lined streets and seaside promenades, Swakopmund is a very popular holiday destination in Namibia. Its pleasant summer climate and long stretched beaches attract anglers and surfers from all over Southern Africa. For the international guest, Swakopmund is a bohemian mix of German correctness and African time, laid back attitude with adrenalin-inducing activities, misty mornings and desert heat. It is colorful, it is vibrant, but most of all, it is fun. In the late nineteenth century, a small group of hardy settlers arrived on the Atlantic shore of the Namib Desert. They brought a piece of Germany with them. Today, this facet of history survives in the town’s colonial architecture, while details of its social and natural history are captured in exhibits at the Swakopmund Museum. Swakopmund is often fondly referred to as the “playground of Namibia”, it has numerous activities ranging from, adventure to exploring the fascinating features of the Namib Desert and the animals and plants that occur and survive here. Embrace the relaxed pace of this idyllic coastal town whilst enjoying coffee and freshly baked pastries in one of the many cafés. Alternatively explore the rugged, sweltering desert on a day tour, or view this awesome, environment from the air on a scenic flight. Find your inner child and push adrenaline to its limits with extreme adventures such as skydiving over the desert or quad biking and sand boarding on the dunes. Take time to get the feel of this quaint town with its historic buildings, museums, shopping arcades and beach bar that has transformed into its own personality by the vibrant use of color and the bohemian lifestyle. 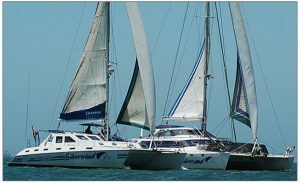 The Catamaran Charters Team invites you aboard the 45ft Royal Cape Sailing Catamaran Silverwind, or the 60ft Simon Sailing Catamaran Silversand, or the 40ft Admiral Motorized Catamaran Silvermoon, to enjoy an adventure packed tour to Pelican Point and Walvis Bay’s beautiful bay area. The chances of encountering dolphins, whales, turtles, seals and Mola Mola (sunfish) make the search for the marine big 5 and adventurous tour by enjoying sparkling wine, fresh oysters and other mouth-watering snacks aboard the spacious and comfortable catamarans. For those seeking something less sedentary, consider exploring the edges of the dunes via fat bike. What a thrill to be able to ride a bike up a dune… never could we have imagined it until the arrival of the fat bike! Although everyone appreciates the amazing scenery, a relative level of fitness and knowing how to ride a bicycle is required to fully enjoy this tour. In the early afternoon your flight proceeds north into Damaraland, an area marked by steep mountain massifs that tower over meandering riverbeds and form the survival structure for desert elephant, black rhino and a myriad of free-roaming antelope species. Your lodge is situated in close vicinity to the geological attractions that are visited in the afternoon or during the morning of the next day. The highlight of these attractions, Twyfelfontein, represents Namibia’s Only World Heritage Site and belongs to one of the world’s largest rock-art sites. After a short flight you arrive at the southern edge of the magnificent Etosha National Park, one of Africa’s most celebrated wildlife reserves. 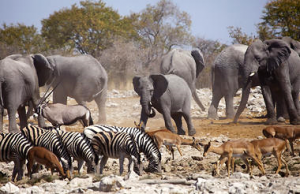 The following days are devoted purely to game drives in search of the abundant wildlife found in the Etosha National Park, which surrounds a parched salt desert known as the Etosha Pan. The park is home to 4 of the Big Five – elephant, lion, leopard and rhino. The Park was proclaimed as Namibia’s first conservation area in 1907 by the then Governor, von Lindequist. Despite the size of the Etosha National Park, only the southern edge of the pan is accessible to visitors. Game viewing in the park is largely focused around the waterholes, some of which are spring fed and some supplied from a borehole, ideal places to sit and watch over 114 different game species, or for an avid birder, in excess of 340 bird species. Popular game species such as giraffe, blue wildebeest, plains and mountain zebra, hyena, lion, leopard, antelopes such as kudu, oryx, eland, as well as some of the endangered species such as Black rhino, cheetah and the black-faced impala are all found here. An extensive network of roads link the over 30 water holes allowing the visitor an opportunity to do a real game viewing safari over the stretch of the park as each different area will provide different encounters. The Etosha Pan dominates the park. This salt pan desert, which is nearly completely enclosed by the park and is lined by numerous watering holes, is roughly 130 km long and as wide as 50 km in places. After breakfast you fly back to Windhoek, arriving in the late morning. You are met on arrival, any stored luggage is returned to you and then you are transferred to Josea Kutako International Airport for the departure of your homebound flight. Arrive home today with photos and stories to share with family and friends of your very special Namibia Flying Safari experience. Welcome Home! Namibia: An entry permit will be issued to you upon arrival into Namibia. Namibia requires two blank visas pages in your passport. We recommend one blank visa page for each other country visited. Your passport must be valid for at least six months beyond intended period of stay. There are no required inoculations for entry to Namibia. However, malaria tablets are highly recommended. You may obtain these pills by prescription, from your regular physician.